Enjoy stunning views from Irazu Volcano National Park and Orosi Valley, plus wander through the streets of Cartago City on this popular tour that takes travelers outside for a taste of Costa Rican nature. Explore the active Irazu volcano some 3,432 meters above sea level and gain a deeper understanding of why Costa Rica's largest volcano is so impressive! Enjoy early morning pick up from your San Jose hotel and make your way 12 miles east along the Pan-American Highway to Cartago. 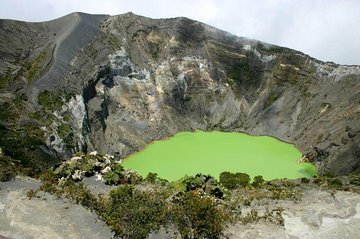 Follow an expert guide through the Irazu Volcano National Park and check out craters, panoramic views and more. Visit the main Basilica of Cartago and continue on to the Orosi Coffee Valley, where you'll enjoy a savory lunch and incredible views. After a delicious meal at La Casona del Cafetal, located on the edge of Cachi Lake, you'll return to your San Jose hotel. This is an amazing tour. We enjoyed the tour, however it is fast and furious, and thus it seems a bit overpriced at 100/pp tip included. The guide and driver were nice, safe, and knowledgeable, but the vehicle for the 6 guests was way too small and cramped. I wish a little more time had been spent in Cartago and the Orosi Valley we had the time, so I'm not sure what the big hurry was, but in general, a good, safe, and entertaining tour. Although it was windy and cold this was an amazing tour provided an exceptional experience to the volcano, valley, and Cartago City. The food was amazing. Nice day tour, not too long for seniors or children. Driver/guide was friendly and helpful. Pick up was prompt. Some things not exactly as described: no water bottle provided we did not stop for overview/photo of Orosi Valley. My favorite parts were Irazu Volcano of course, and the oldest Catholic church in Orosi.